Last year, when I heard about the new upcoming spec in CSS – CSS Grid Layout, it got my attention straight away. Keeping an eye on it (well a little bit…) and then to realise it was shipped into most of the major browsers in March this year (2017), I started digging into it a bit more. At the same time, I thought it to be a good idea to head north from London for a WordCamp, to WordCamp Manchester 2017. This WordCamp, in the United Kingdom, usually takes place in autumn of every year. After the opening talk by lead organiser, Tom Nowell, I attended Sue Fernandes’ talk on Getting ‘Sassy’ with WordPress theme development. As a SASS user myself, it was nice to see how someone else approach it too. There were good follow up questions eg. the difference between SASS and LESS… just to confirm that I am happy that I went the SASS route. Next up was me, in the technical track. I am greatful to the organisers putting me in an early slot – that sure helps with the nerves as a first timer, speaking at a WordCamp. Also, the help Dave Pullig from Delicious Media and other peeps, figuring out how to get my laptop to display duel screens! Some weird settings I already had on my laptop and the age of hardware, made it a bit challenging. Another thanks to the excellent MC – Rhys Wynne – he created a relaxed environment to make things a little bit less foreign. 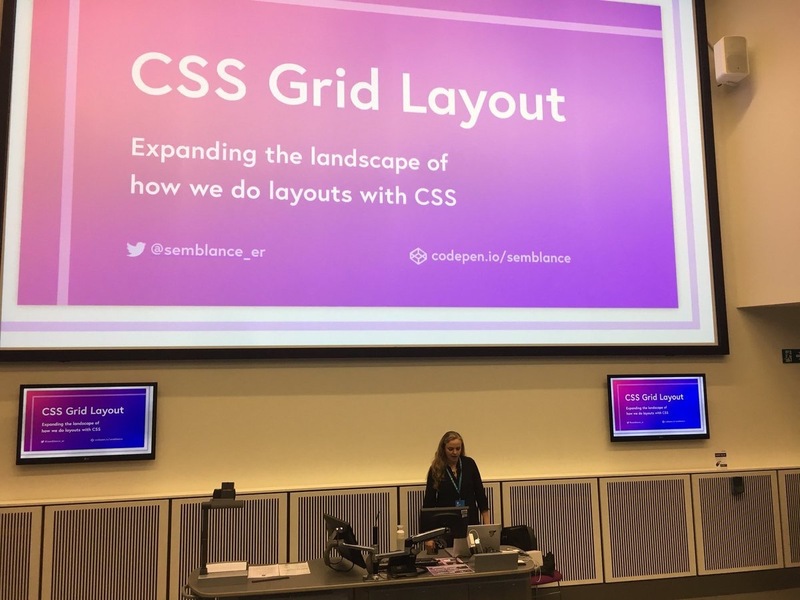 Do check out CSS Grid Layout – Expanding the landscape of how we do layouts with CSS [watch this space for WordPress.tv]. You can find my slides here – loads of recources and CodePen demos too! Wrapping up my talk early in the day, I was able to really enjoy the talks during the rest of the day. 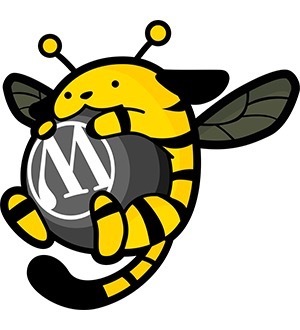 Unfortunately the norm with WordCamps, I always miss talks I wanted to see, but will definitely be catching up with them on WordPress.tv. The next one, I was however lucky to attend, was the wise words of Graham Armfield, in his talk Designing for Accessibility (make sure to check out his slides). Definitely not a first time speaker, and his talks on accessibility always have new insight and something new to learn and consider. And then, it is also great to learn that the LEGO website is awesome at conforming to accessibility! My eye always catch a well thought through design and I have been a fan of WP Engine’s design approach for a long time. The funky design direction of Edmund Turban‘s talk Production-ready WordPress: Deploy your code using version control and continuous integration (and yes, I did notice the t-shirt went with the presentation design… an idea I will definitely keep in mind…), was well suited with the release of Stranger Things on the same weekend… But not just the design, the whole presentation was extremely informative regarding workflow and testing. I have made notes of things I would definitely like to try, to improve my own deployment workflow. Almost last, but most certainly not least (also kudos to him for holding his nerves till that time of the day! ), Ben Usher Smith pulled off a great presentation, which I thought was actually perfect timing of the day. With his great story telling, and showing off his excellent design skills through his presentation, it touched base with less technical people and definitely technical people too. His talk about Progressive advancement is something we should all keep in mind working on the web. Tim Nash from 34SP, doing an excellent sequel to his talk earlier that day (one I will definitely catch up on WordPress.tv). Kayleigh Thorpe from 34SP, giving a great introduction and answering common questions wrapping your head around setting up and using Yoast SEO. 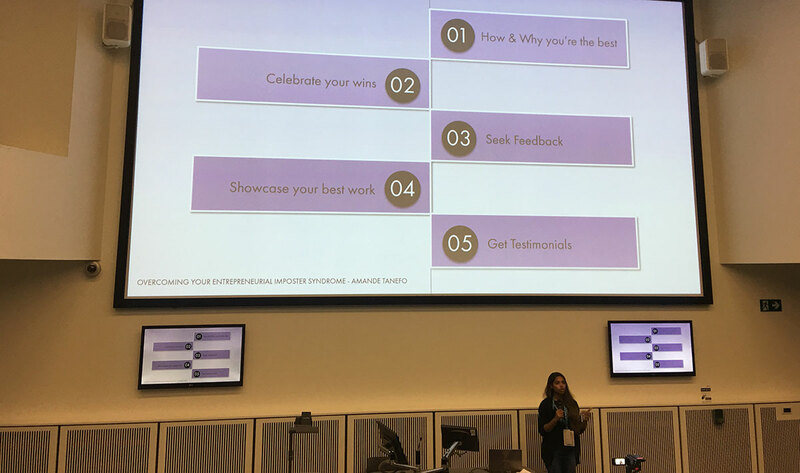 Amande from Launch and Sell on overcoming her imposter syndrome. Her last slide gave 5 great tips in a nutshell. Ending the day with an introduction from Web Matters – a new independent, member-driven industry association for those who create and work on the open web.